This past week has been one heck of a week. Part of the week I was swamped with adult-stuff and the remaining part, I spent remembering what it was like to be in college again. My conclusion: college is awesome.When else do all the good parts of childhood and adulthood meet in one place? 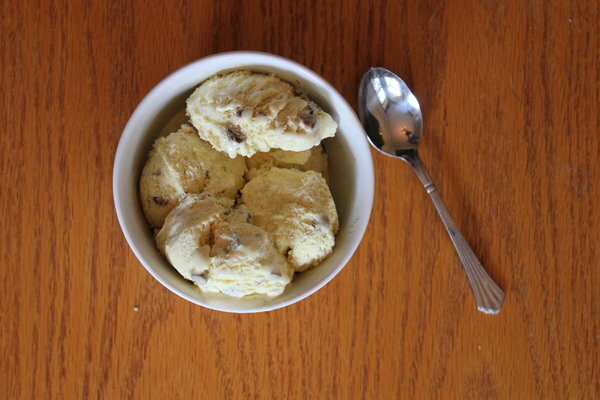 …I can name one other “place”: Saffron and Pistachio Ice Cream. It combines the soft creaminess of ice cream (which I used to stir into a melted, soupy cream when I was little) with sophisticated saffron and pistachios–a delicious intersection of childhood and adulthood. While this recipe calls for some expensive ingredients, you can still stick to a budget by using limited quantities or by shopping smart. For instance, my Trader Joe’s saffron and store-brand pistachios only set me back $3.84. This costs more than my staple vanilla frozen yogurt. But if there’s anything I learned from college, it’s that the best things happen when you veer from the plan. Combine milk, saffron and cardamon in a sauce pan and bring to boil. Immediately after it begins to boil remove from heat. In a bowl whip together yolks and sugar until pale and thickened. Gradually whisk hot milk mixture into the yolk mixture. Return custard to the saucepan and cook over lower heat until custard is thickened, stir constantly, about 10-15 minutes. Strain into large bowl and chill in fridge for at least 2 hours. Stir in whipping cream and pistachios. Churn in ice cream maker according to manufacturer’s instructions. Transfer to container and freeze. Categories: Blog, Budget, Featured, and Recipes. I'm Cooking For...: Dinner Party, Late Night Snack, and Summer.